Xena had timed her nap just nicely -- we were able to have a leisurely lunch. Soon, she woke up and we decided to explore the area around Emerald Lake before taking the train back to Menzies Creek. It was a beautiful day, with lots of greenery and interesting birds to be seen. Xena had a good time chasing the birds around. Then we found this lake with lots of ducks. Xena took a moment to watch the ducks dive into the water to catch fish. I have to admit, it was quite fascinating for me too. Check out this duck preening itself! We walked around and reached Lake Treganowan, which had these colourful two-seater paddleboats for hire. I was absolutely thrilled at the thought of Xena enjoying a paddleboat ride. Unfortunately, we were rejected as the lady manning the boats said that Xena did not meet the age/height requirements to be on the boat. I looked enviously at all the people enjoying their boat rides. And oh, I have to mention their funny pricing. It's $13 for 15 minutes and $14 for 20 minutes! We explained to Xena why she could not get on the paddleboat and she took it well. Of course, we took this opportunity to tell her that if she started eating well, she'd grow bigger soon and could get on a paddleboat! She seemed amused at our desperation to make her eat. 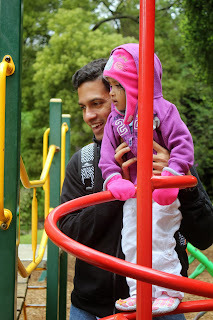 We found a really nice playground amidst a lot of trees and Xena had a blast. I asked Viv to put Xena on this tree for a photograph. She wasn't impressed. I found these leaves too interesting not to photograph! Finally, it was time for our train back. 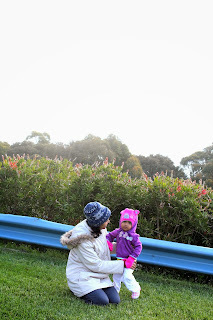 As we walked back to the station, Viv saw someone's train ticket on the ground. He bent to pick it up and checked if he had our tickets or not. It turns out that was one of our tickets! And the rest were not in his pocket! We had covered such a huge area while walking around that they could have fallen anywhere. Viv looked distraught because he's one of those super-careful folks who never loses anything. 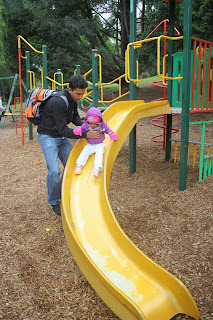 I went back to the playground to look for them but had no luck. We didn't search any further as we'd have missed the train. Luckily, he had the receipt from when he had bought the tickets, but no one checked and we took Puffing Billy back to Menzies Creek where we had parked. 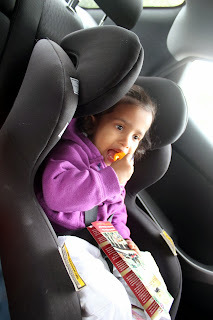 Back in the car and actually eating a snack! 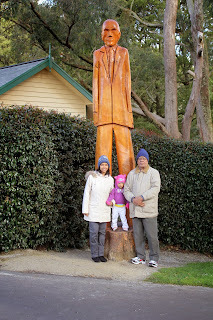 We decided to drive up to the top of the Dandenong Ranges to Mount Dandenong, 633 metres above sea level. It was originally founded as a survey point in 1861, but now the location is famous for a restaurant called SkyHigh, and other places of interest around it. We were not particularly hungry so we didn't eat there, but decided to take a look around. There is a fee of AUD10 per car to enter SkyHigh. We went up to the viewing terrace and got some breathtaking views. I was trying to get a shot of Viv, Appa and Xena but she was more interested in clicking the photo herself, so she started walking towards me! 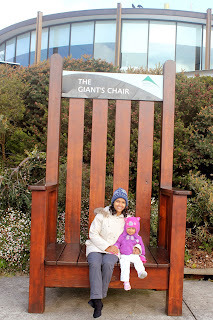 The Giant's Chair is a gigantic novelty wooden chair placed in the front lawn. According to the SkyHigh website, the chair belongs to 'Igor the giant' who likes to sit on it and enjoy the views. Xena and I play on the grass. This Kugel ball sculpture, dedicated to world peace and unity, weighs 2.5 tons. The spinning granite ball, weighing about 1.5 tons, is supported entirely by water pressure! And now it's Xena's turn! SkyHigh also has a beautiful garden, known simply as the English Garden, with gravel paths, wooden arch bridges and even a man-made stream. We saw manybeautiful flowers. My Dad would love it! As usual, there HAS to be a photo of us perched on a tree! It was finally time to get back home. And make dinner plans. Of course. That's what holidays are all about, isn't it? Where to go, what to do and what to eat. 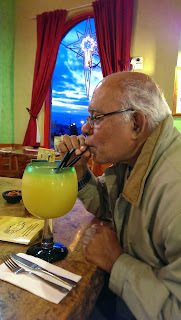 We decided to the relatives we were staying with, to a Mexican restaurant. 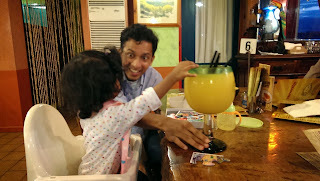 We somehow convinced Appa to have this Margarita-like drink, which was so huge, it took five of us to finish it! Xena was very curious about it too. 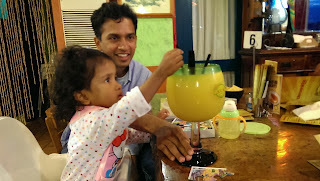 Watch Viv's face as Xena says, "Xena wants to drink this!"